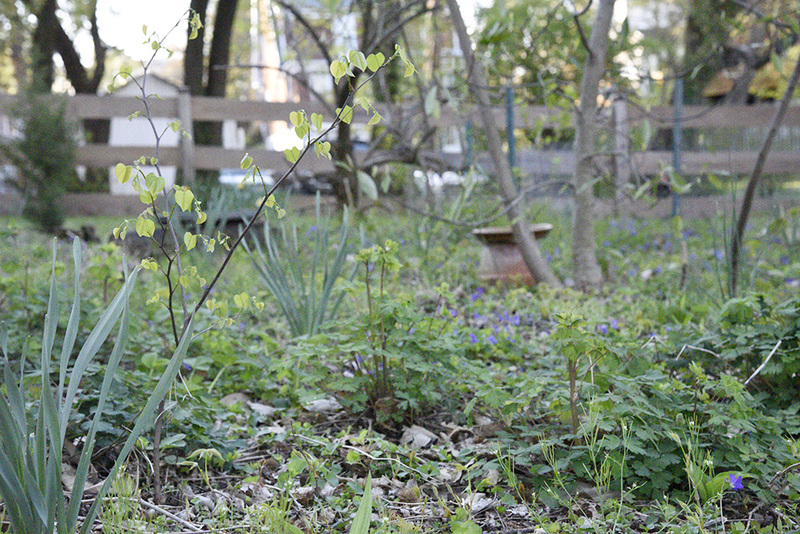 The garden is finally greening up which is nice as it seemed embarrassingly brown. 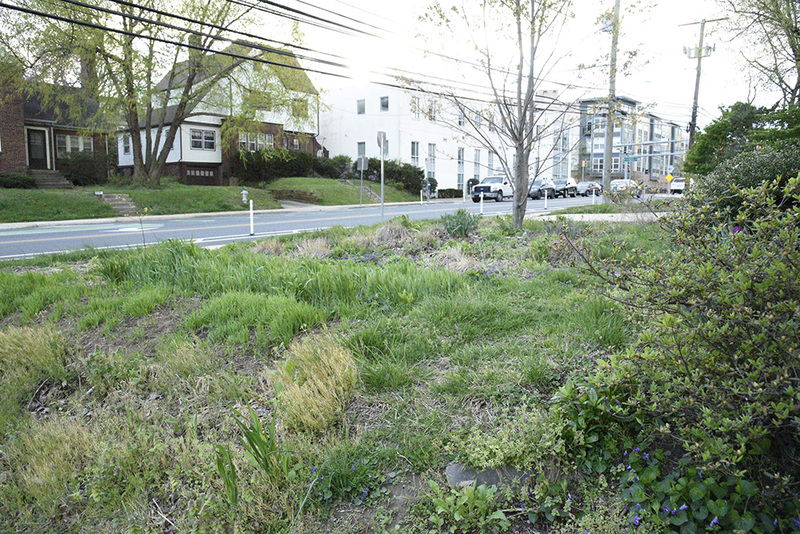 This is understandable as native plants (other than ephemerals) are usually the last to green up. I don’t have many native ephemerals but I do have one, the common violet (Viola sororia), which covers a large portion of ground in a very regal royal blue. While not especially a favorite of pollinators, the violet is a host to fritillary butterflies and food for wildlife including ants who help spread the seeds. Luckily, violets are also covering the front yard meadow which I have to say even with the smattering of daffodils, wasn’t too easy on the eye. I suppose the brown wouldn’t be so bad if it were brown tufts of grasses such as little bluestem but in my case it’s a mix of dead leaves, cardboard and sticks. The meadow looking a little better thanks to spring weeds (a word I will no longer be using). 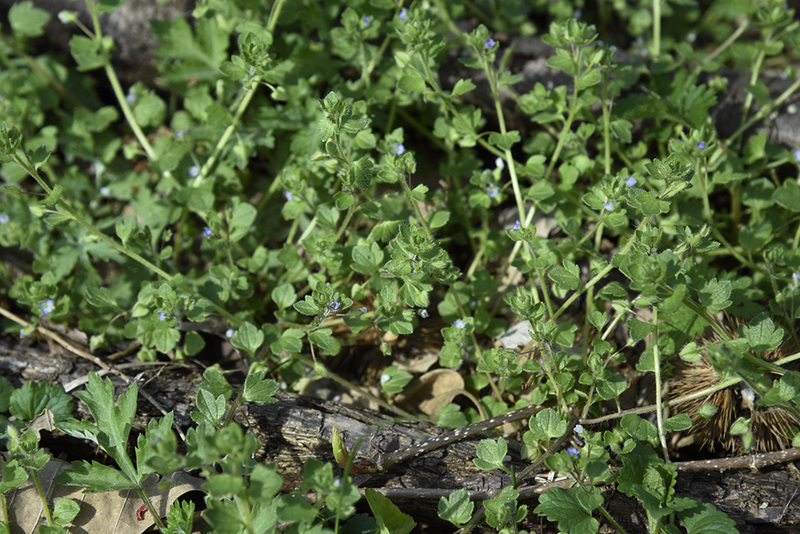 Ivy leaved speedwell (Veronica hederifolia) – This plant is an annual native to Eurasia. It is categorized as invasive by the Invasive Plant Atlas but I can’t see how it could be as invasive as English ivy or lesser celandine. 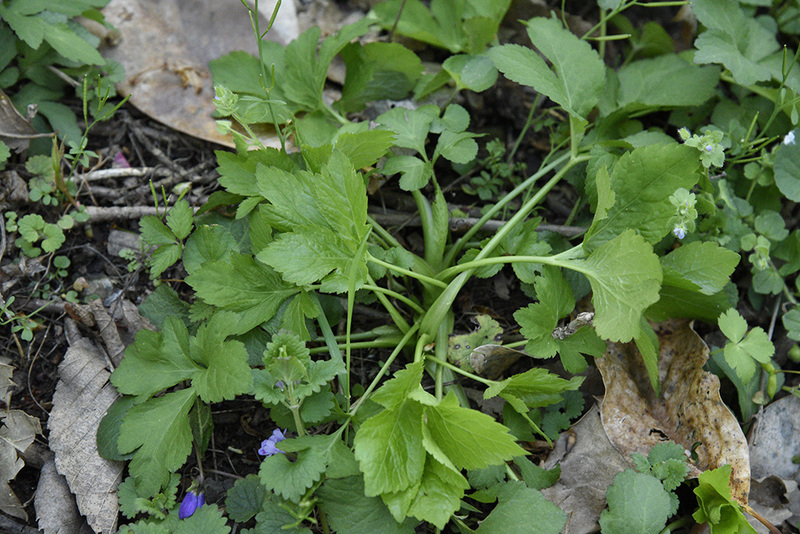 It provides a low ground cover that will disappear after the Virginia creeper and other perennials start to leaf out. Hairy bittercress (Cardamine hirsuta) – I really like this one. It is a non native annual but not listed as invasive. It adds fresh spring growth to areas that otherwise would be dead. Once the seeds are set all it takes is a slight touch causing them to shoot out in a silent explosion. It’s also edible and highly nutritious. Deadnettle (Lamium purpureum) – This is another one I like. Also a non native annual and a member of the mint family. 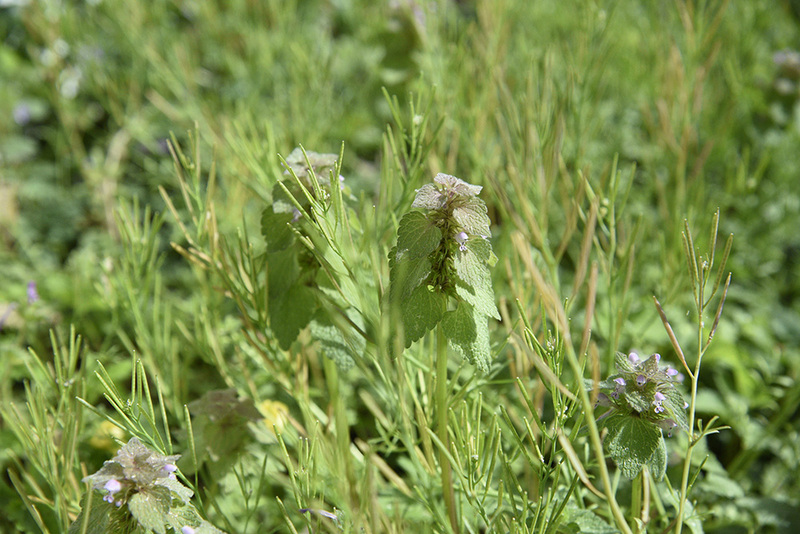 It is much less obtrusive than its cousins, henbit and ground ivy and provides an early source of pollen. Wild garlic (Allium vineale) – This is the one that comes up everywhere in whispy clumps. It is listed as invasive and I’ve seen large stands in some high quality natural communities. It is edible and tasty but not so easy to pull especially in compacted soil where it usually comes up in my garden. 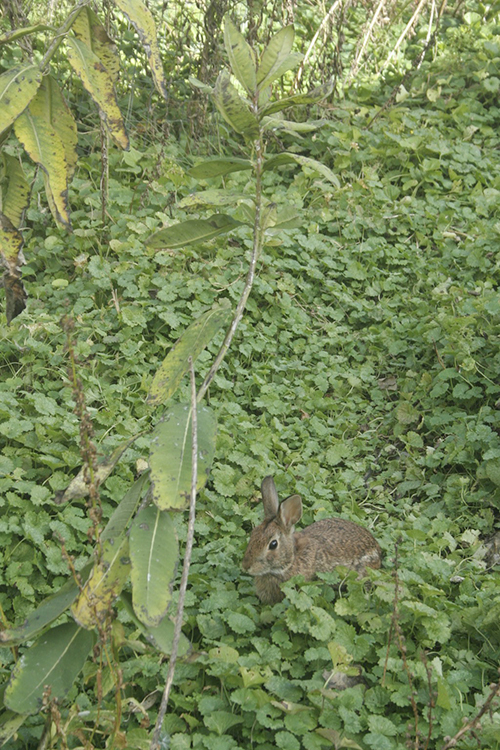 One of the rabbits in the ground ivy (photo taken in summer). Ground ivy (Glechoma hederacea) – As I’ve mentioned many times, this is not my favorite plant but I’ve resigned myself to the fact it’s not going away any time soon and it’s one of those plants where the more effort I put into removing it, the more it just comes back tenfold. The interesting thing is it seems to work well with violets as neither plant seems to gain the upper hand. This can probably be attributed to the fact that each fills a different niche. Violets, with their thick rhizomes seem to go deeper than ground ivy whose rhizomes form a thick mat above. Both are extremely vigorous growers. I could go on about my trials with ground ivy and maybe I’ll dedicate an entire post to this plant. For now I want to make a proclamation. I’m going to try not using the word, weed. And it’s not because it describes a recreational and medicinal plant. The real reason is these days the word just doesn’t have a standardized meaning and therefore it’s meaningless. Plants labeled as weeds can be good for ecology but bad for our social status. Weeds can be both good and bad for ecology. A weed to one person may not be a weed to another. Weeds can be bad for our crops but good for ecology or a weed could be our crops and bad for ecology. 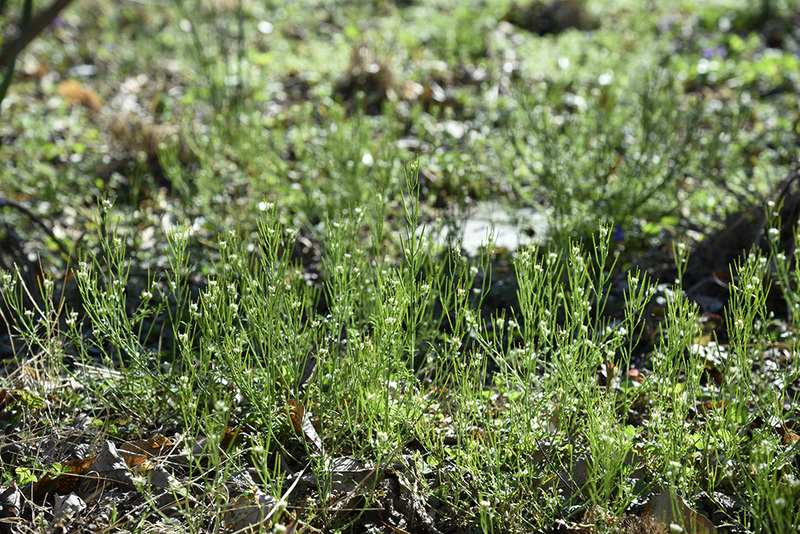 Weeds can be the first plants in ecological succession or they could be invasive. They could be anything. This will not be easy, for I actually love the word but feel we need to move beyond it. Weeds are plants with both good attributes and bad. Resident squirrel in American elm giving me the laser eye. Whew! Good to get that out! Now back to my garden which is all a stir. The rabbits, at least 4, are running and jumping and getting in my way. The robins are back in the bird baths, their already fat bodies getting fatter as the water fills up their feathers making them look like water balloons. The air is filled with the chattering of house finches, house sparrows, robins, wrens, doves, goldfinches, cardinals, song sparrows and even chickadees. 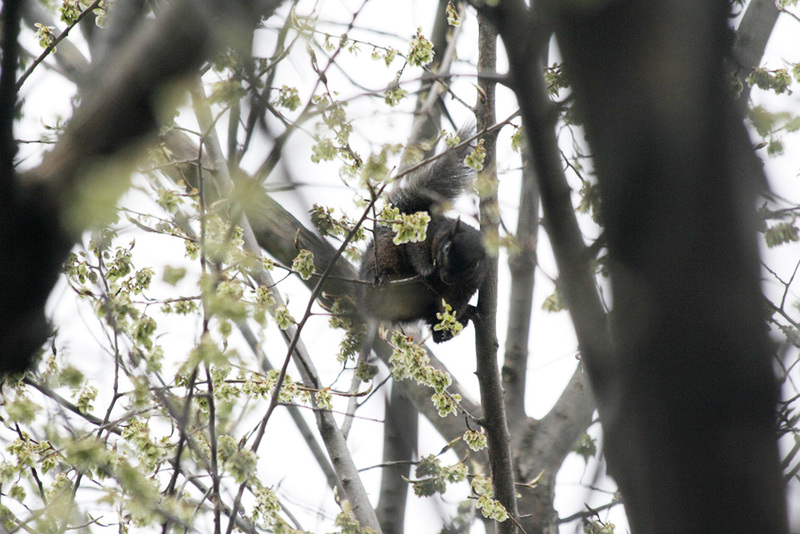 All, including the squirrels, seem to enjoy the elm which I’d thought was an American elm, then decided was a Siberian elm and now am back to thinking is an American elm again. I decided this after closely examining the seeds which look like this as opposed to this (Scroll down on the linked pages to see the seeds). I’ve spent too many hours setting up fences around my garden beds. I was offered some free deer fencing which kind of got me motivated. Will it work? We shall see. Well, it’s official. I finally placed the seed order from Ernst seeds for the slope. 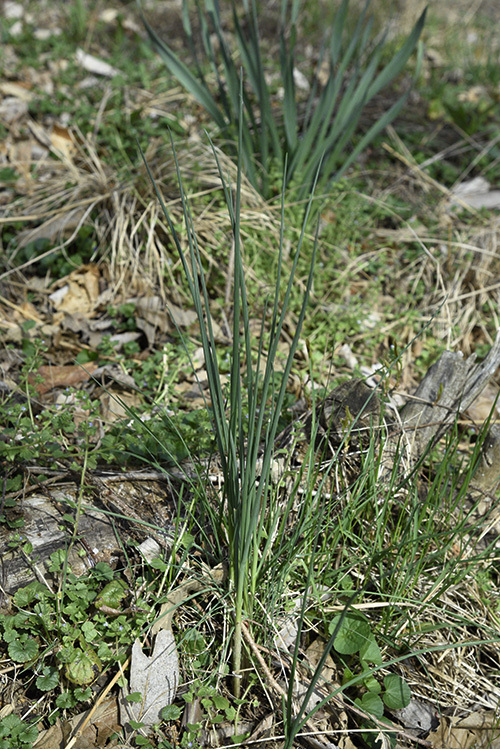 I settled with little bluestem (PA ecotype) and slender mountain mint (pycnanthemum tenuifolium) (NC ecotype). An ounce of each. The total came to $14 including shipping. I’ll plant them in about a month after the spring weeds (whoops I said weed. I told you it would be hard) die back. They don’t need stratification and they’re warm season plants so they should start growing as soon as I plant them. Knock on wood. I’m pretty excited about this which I’m hoping is honewort (Cryptotaenia canadensis) and not goutweed (Aegopodium podagraria). They grew from seeds I collected from nearby. I moved a volunteer redbud to the front yard and am happy to see it seems to have survived the transplant. Black cherry (Prunus serotina) seedlings are popping up everywhere. I should probably pull them but knowing me, I won’t. One of the young volunteer redbuds that I didn’t transplant. Columbine getting ready to bloom.